This article is about the point of entry or exit. For other uses, see Gate (disambiguation) and Gateway (disambiguation). 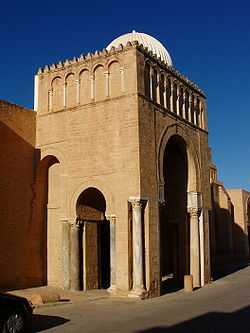 A monumental gate of the Great Mosque of Kairouan also known as the Mosque of Uqba, in Kairouan, Tunisia. A gate or gateway is a point of entry to a space which is enclosed by walls. Gates may prevent or control the entry or exit of individuals, or they may be merely decorative. Other terms for gate include yett and port. The word derives from the old Norse "gata", meaning road or path, and originally referred to the gap in the wall or fence, rather than the barrier which closed it. The moving part or parts of a gateway may be called "doors", but used for the whole point of entry door usually refers to the entry to a building, or an internal opening between different rooms. A gate may have a latch to keep it from swinging and a lock for security. Larger gates can be used for a whole building, such as a castle or fortified town, or the actual doors that block entry through the gatehouse. Today, many gate doors are opened by an automated gate operator. Mon Japanese: gate. The religious torii compares to the Chinese pailou (paifang), Indian torana, and Korean hongsalmun. Mon are widespread, in Japanese gardens. This gate and massive gateposts has no locks—a gate marks a borderline in ownership/use and can allow passage. 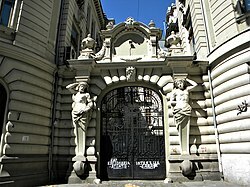 Wikimedia Commons has media related to Gates and Portals. Look up gate in Wiktionary, the free dictionary.